Sportfishing for blues from Newburyport and Salisbury, MA waters is always an adventure. The fishing vessel Sydney Lee with Capt. Bob Yeomans and crew will often take you to waters in the Gulf of Maine and off the Isle of Shoals. Bluefishing MA waters is for the very skilled angler who is willing and able to tackle what these fish are known for – a hard strike followed by some great action that puts these fish clearly in the top of the sportfishing category. Watch out for those teeth though when handling any bluefish, or let the crew of the Sydney Lee deal with the fish once it is boarded. Color: Blue to blue-green dorsally, fading on side to silver or white on the belly. 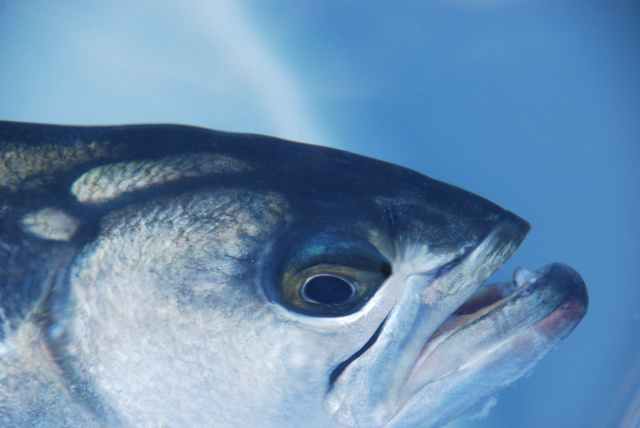 Body: Bluefish have a stout body with a deep head and a moderately pointed nose. The mouth is low with a projecting lower jaw. The first dorsal fin starts in the middle of the back and is much smaller than the prominent second dorsal fin. The tail is forked, but not deeply like its relatives, the pompanos. They have a mouthful of sharp teeth and aren’t afraid to use them. WE WILL SEE WHAT 2019 BRINGS.